Just twenty-five LegalMatch employees will be battling for the coveted Ping Pong Grail in the coming weeks. Veteran staffers Lisa and Ben are well acquainted with LegalMatch ping pong history and worked tirelessly to fairly divvy up the competitors. The result was the formation of five all-star teams. Inter-level play begins next week pitting similarly skilled pongers against one another and should prove for some serious excitement. Below is the official scouting report. Empire State of Pong: Team members include Teejay, Matt, Melinda, and Jake with Team Captain Lisa at the helm. This is a veteran team with great chemistry and a history of brilliance. Empire State of Pong’s strongest players seem to be Teejay and Matt who were both on King Pong, the triumphant 2004 team, while newbie Melinda is still considered a wildcard. North Bay Heats: The North Bay Heats tout Teejay’s protégé, Jerry, as their strongest but teammate Kimber has been talking a big game and assures that he can deliver. Chico, Shawn, and Team Captain Niesha will play a key role in team success. Pong Royalty: Chas, Ben, Ryan, Ravi, and Captain Byrdie are rumored to be the strongest team overall. Chas is a former member of the winning 2004 team and is known widely for his sportsman’s prowess. 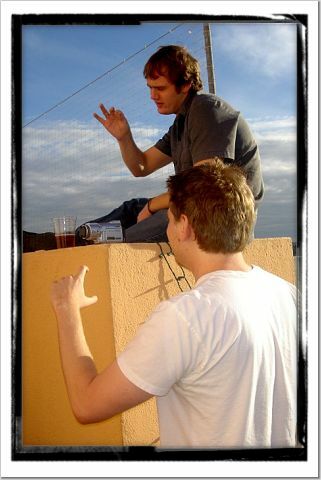 Ben and Ryan assure that Empire State of Pong will be going down. Pong Gone Wong: Named for Team Captain Stacie, Pong Gone Wong is another front-runner that is sure to provide great battles. Joe, John, Kelly, and David comprise the other members of the team that promise to crush the North Bay Heats. David is rumored to be the office champion after beating Eugene from Donkey Pong in an exhibition game last week. Donkey Pong: This guerilla team is bent on making sure Pong Gone Wong doesn’t go too far. Team Captain Pam has been prepping Donkey Pongers Eugene, Ken, Roman, and Brad for their upcoming skirmishes. Eugene contends that David and Teejay should beware. You can call it ping pong, table tennis, or wiff-waff but it’s all the same to me: one of only a few racquet sports allowed indoors (office racquetball was discussed, very briefly). Ping pong duals have been popping up in the office like Somali pirate attacks in the Gulf of Aden so it must mean that a LegalMatch Ping Pong Tournament is in the works. Brackets and seeds are being set so dust off your paddles or order a new one because it’s going to get heated. Word around the office is that there are some pretty beastly table tennis hustlers. I don’t want to hype this too much but you should probably come with a juice box or some orange slices to rejuvenate after this face-melting ping-pong furry. Don’t worry if you aren’t a pro at pong because there will be handicaps (see golf). I know I’ve been honing my skills but still plan to bring a triple-threat of mediocrity: bad eyesight, lacking small motor skills, and a carefree attitude. Game on! LegalMatch Table Tennis Captain's Club. Ten LegalMatch Table Tennis Tournament Captains. Chosen for their abundant skill, their personalities and their abilities to get the job done around LegalMatch. These Captains are equipped to lead their teams to the height of Excellence as Greatness is just around the corner! Let's get to know a little bit about these LegalMatch ladies. Lisa Zanassi (CJ) - Team ‘King Pong’ - Graduate of Novato High School- I had a giant tortoise named Tomaso. Rumor has it that he was eaten by the neighbors after he escaped from our backyard. After Tomaso I wanted a Goose but never got one. – I went to Bartending School here in SF before I left for law school. I established a new record for fastest 12 drinks made. William Faulkner is my favorite author. I could read The Sound and the Fury 5 million times. My first Car was my aunt’s Mercury Capri. It died a long time ago. Most Acceptable Nickname – Cult Jam, Mouth, WOP, Tuo, Mona - I was the first girl in the Zanassi Family in 87 years. They strongly believed that I would be a boy and named me Christopher James. They changed it to Lisa after I came out. I always wanted to grow up to be like my uncle. He has always been such a moral and stand up attorney. He really sets the bar in terms of the type of attorney that I strive to be. Ona Ahumada – Team ‘Tae Pong Doh’ - I went to Bear Creek High, or as our vice principal used to say Bar Crick High – While in school my favorite activities included backpacking, rafting, going to football games and playing volleyball – My favorite writer-Chuck Palahniuk/ Favorite athlete-Terrell Davis - Favorite Film star is Johnny Depp and my favorite Director is Quentin Tarrantino. Favorite quote: - If your opponent is drowning, throw him an anvil- James Carville – I was so bad in my 87 Ford Mustang - my first and best car. People say I am the greatest dancing machine. Lara Dillon – Team – ‘Ping Dynasty’ - Attended Del Campo H.S. Fair Oaks, CA One of the suburbs of Sacramento (Sac town – for those in the know) – I love to swim, travel. Just put me on a plane and I’m there - though, i must say, wine tasting is my very favorite past time. Jerry Rice is my favorite athlete: I have been a Niner fan my whole life. Not only is Jerry a major and enduring talent, but a humble one. Favorite Film Star would have to be Michael Madsen: The ear scene in reservoir Dogs – can’t say much more then that. Director: Spike Jones is the best! “Being John Malkovich” and “Adaptation” both blew me away. My first car was an Acura Integra 1990. Got it when I tuned 16. Maybe I was a bit spoiled but it was the family car and they gave it to me. I had it for over ten years – through high school, college, and my first four years in the city – where I commuted everywhere. The best car ever – never a single problem with it. I cried when I sold it. Tan Booty? I won’t tell. –That’s in reference to my maiden name: Tanfani. Everyone thought it was Tan Fanny – even though it is not pronounced that way. Ahp, ahp. Don’t say it. Tina Trexler – Team ‘Spin Doctors’ - Bishop O’Dowd High -Oakland, Ca – We had tons of pets growing up, my favorites were “gizmo” the guinea pig and “Garfield” the cat who my Mom accidentally ran over in her car one day, he actually survived and we had him for about 15 years! My first car was a 1972 Convertible VW Bug, it didn’t last too long because I pretty much ran it into the ground and it currently resides at “pick your own parts” yard. What am I proud of? Proud that my track team came in 2nd in a relay marathon in Guam which was a huge accomplishment because we beat the US Air Force and Marines that both had teams running in the marathon. My mom was a nurse and my Dad was a secret agent man, he’s in the FBI. It was pretty cool growing up but there were some downsides, like sneaking in or out of my house on the weekends was virtually impossible with my Dad on duty! Sue Hammer – Team ‘Hammer’s SlaHammers’ Great Neck North Senior HS in Great Neck, NY. 2 High Schools, North and South. I lived on the “North” side of town. – Guess what? I have only owned 1 car in my life (I know, isn’t that hard to believe?). And, YES, I still own it! It’s a 1984 Honda Civic but I admit it’s been garaged many of its years. You would be shocked at the mileage (around 80,000). It’s kind of a tool around on the weekend car now, but sometime in the not too distant future I may think of a replacing it. With my last name, most nicknames center around that. Early in my career, I was called Sue Hammer, the Programmer (they liked the rhyme). Sometimes I’m just called “the Hammer.” I am fond of Doug Ott’s phrase….”They call her….the Hamma!” -- I would say wine tasting in the wine country is one of my favorites. Unfortunately, I can go out there and buy more than I can drink! -- When I was in college I won an award called “Rookie of the Year”. It was awarded to 1 person annually for their fund raising efforts. It was awarded as a surprise during a large dinner/ceremony, and I was definitely surprised! My mom still has the silver cup award. -- My dad was a career salesman in the costume jewelry business, selling to major department stores and retailers primarily in NY/New England. My mom was primarily a homemaker, although before she was married she did work as a French stenographer and later worked as a claims examiner for the U.S. Railroad Retirement Board. Diane Tran – Team ‘Bada Ping’ You can call me DEE, but don’t you call me DI! - D#M%T ! Yeah baby, I’m from the biggety “O” Oakland High – where me and my Chihuahua- Yo quero taco bell – ruled! Now my favorite pets are in my fish tank. Except one ‘Clown Fish’ got stuck in a rock cave. We gave him a eulogy and then we flushed him. This is where the tears come up. My favorite quote - “The only thing to fear is fear itself”- FDR My First car? Oh you mean April? My Dodge stratus 99 is currently ready to be sold. Any interest? Favorite weekend activity would consist of going camping, fishing, surfing, and biking, shooting photography… anything outside. Ushma Multani – Team ‘Net Income’ - Villa Theresa High School, Mumbai, India My pets were Rabbits- whitey & pepper (they were soooooooo cute) – But they were baby eating rabbits and I had to give them back to the store when my little brother was born. Btw, I also have an older sister. My first car my dad bought me was a Maruti Esteem-- too bad it died on me sooner than later. Some call me “USH” and some call me the “Bombay Baller.” They called me “Cookie” in high School because I was always eating cookies. I really like to cook. And I travel for adventure. I’ve been everywhere. What award did I win that I am proud of? Yes, Well, that would be…Miss (I can’t tell you) of 2002. My dad, Sudir Multani, who is a successful international real estate broker, is my inspiration. Lesley Murray – Team ‘Cheech and Pong’ Went to Redwood High School and grew up in Marin. "Apparently people think that Marin is snobby and weird and cultish --- but I babysat John Walker, and he had to go all the way to Afghanistan to get snobby and weird and cultish." Lesley enjoys hanging out with “Chili” (the coolest poodle you'll ever meet), and also puppy sitting, crossword puzzles, suspense books, horror films, and is blessed with a gift for drafting excellent players--- Doesn't have the attention span for movies, but loves Law and Order marathons. Hates reality TV. She can't stand tomatoes, so if you're planning on cooking for her, white sauce is the way to go… oh, and don't forget a bottle of merlot. MAY THE BEST TEAM DEMONSTRATE THEIR GREATNESS! The LegalMatch Ranking Committee Brings Order to the Draft Table. Before the players were drafted by their Captains, the Ranking Committee; consisting of Claudia Picanco, Steve Chastain, Devyn McDonald and Jonathan Lott have prepared the divisional rankings. This sets up the list of eligible draft-able players and where those players rank amongst the body of 50 players within the 4 divisions. Jonathan Lott presses his point to the committee as Steve Chastain and Claudia Picanco listen in. Now, to get to "Greatness" The Captains will need to draft for Greatness. This means they will need to review the ranking results from the 'November Challenge Matches' and pick the players they believe can build enough 'Team Points' to walk away with the "2005 LegalMatch Client Matching Plaque". The Draft, held under the supervision of 'Queen Dana Buccheri,' was filled with drama and controversy. Since 6 of the top 10 players were already locked in as "cinch" picks it called for clever strategy on the part of each Captain to find a way to get the players they wanted and needed to fill out their roster. Some players selections had to be settled over a game of "Rochambeau." The LegalMatch Penthouse Table Tennis Tournament got off to a great start with the 6th seeds trying to hold their rank position against the 7th seeds. All four Divisional 6th seeds did manage to hold their own; as Lisa Zanassi, Pamela Wu, Michael Gutman and Yuri Gelman all won their matches scoring 10 points each for King Pong, Lord of the Pings, Ping of the Jungle and Cheech & Pong. Tonight, it's the # 8s versus the # 5 seeds. Among the more exciting match ups from that group will place Division 'A' #5 ranked Randy Wells against #8 David Merritt. These two had some very heated battles during the November Challenges. Expect this match to go down to the wire. Team Point totals --	King Pong -	60,	Tae Pong Doh -	20,	Ping Dynasty -	10,	Spin Doctors -	20,	Hammer SlaHammer -	60,	Bada Ping -	30, Ping of the Jungle -	20, Net Income -	50, Cheech & Pong -	40, Lord of the Pings -	70. If you haven’t met Dr. Jim yet, I suggest you take the time to introduce yourself. Dr. Jim is a LegalMatch legend. 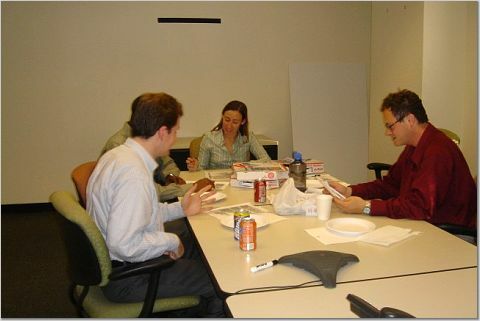 Attorneys who were boarding up their offices in preparation for Hurricane Ivan took the time to talk about the future with Dr. Jim. And Dr. Jim offered them the solace and security of LegalMatch memberships. Some people call him ‘the Doctor.’ In New Member Services, we call him ‘the Hurricane.’ But, we had no idea that he was a veteran ping pong player whose skills were honed at Davidson College in North Carolina, before he joined fantasy ping pong. “When I was in college I wasted many--- many hours playing ping pong on the back porch of my KA fraternity house at Davidson College in North Carolina. Great memories--- Most of the time I was also fully clothed as well. Drinking Beer while you play makes you think you are fantastically good at the game and even if you lose you could care less. Under even the most bazaar conditions I did not fall off the back porch of the fraternity house including games in the rain and snow. There were some close calls including one diving back handed save which was hit just inside the back line while my partner was gone for another beer. I think the other team was still playing. As Michael Guttman’s Supreme Court jersey said “So help you God,” when you come up against the Virtual Pingpongers in the Fantasy League! Can I get a Whit-Ness is in the lead with a dominating 70 point total in week 1! Fantasy Team Captain Whitney Merrill owes much of his success to real life team captain Sue Hammer whose team Hammer-SlaHammer dominated the tables this week with a record high score of 40 points! Clearly week one is Hammer Time! Following close behind Can I get a Whit-Ness are Josie and the Pussycats who managed to rack up an awesome 60 points. Josie came up huge in the draft by picking up Lisa Zanassi, the mind behind the menace that is King Pong. What a difference a week makes! Mad Dogs in the Fog; LA Pongers and Smashing Elbows are caught in a three way tie for first place. So Said Dana B. last week, when I asked for an interview. She is definitely pressed for time, profiling attorneys, managing the PingPongWallaWallaBingBongs, plotting a LegalMatch Tiki Brouhaha for the culmination of the Tower Tournament. If it was up to Dana her entire Fantasy Team would be eating Wonton soup from Lee’s deli with rice noodles to carbo load before games. She’s counting on Coach Ziffrin to lead her players to a winning record to boost her team’s fantasy points. Look for more updates here as the weeks continue to produce results. LegalMatch Penthouse Tower Table Tennis Tournament. This LegalMatch Tournament promises to be something very special. The contestants are lining up fast. The Membership Group has already jumped the gun before the list of invitees have even been sent. Ray Whelan, David Merritt and Frank Perkins have already sized up the new regulation playing surfaces and started to name the tables in their honor. Who are these guys? And Peter Reis is still walking around mumbling something about having this twisted torpedo backhand something or other slap shot that is supposed to be out of this world, ranking him among the top squeegie window washers in the universe. We'll keep our eye on this kid. The competitive banter in accounting is heating up between Diane Tran, Augie Chun and Kurt Jerdon. Chas Blackford in Marketing has surfaced from underground to let it be known that he's fit and ready to show his stuff. I heard Laurie Ziffrin and Michael Pascoe in Member Services comparing the virtues of the rubber paddles versus those of a fine natural or synthetic polymer blend. VP Doug Ott has carved his initials into the championship bracket and is taking on all comers. Randy Wells, however, has required that the matches are played before anyone can be declared the winner. Sorry Doug. You had to know that It didn't take Ed Lin long to show off his proficient unorthodox grip while engaging Yuri Gelman in an inagural game after assembling the two new roll away Stiga Pro Tables. Many thanks go out to "da crew," Jeff Sacramento, Augie Chun, Michael Gutman, Benny Sandholm and Matt Griffith who helped moved these 2 ton tables from Kurt's truck and up to the penthouse. And of course, nothing would have happened without the cooperative efforts of Kurt Jerdon. Thanks Kurt. New York, Los Angeles and Virtual Team, USA - you too can get in on the action. Just pick a winner and you too will share in the excitement and the victory with a 'Matching Pin' of your own. More information about this will be forth coming in the weeks ahead. 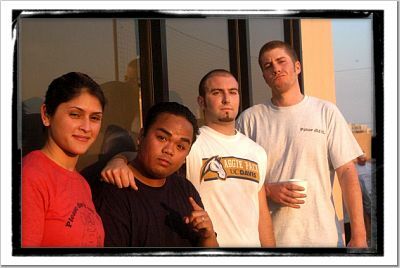 2004 Rooftop Tourny: Affirmative Action Beats Supreme Court! It took a long long time...some had waited years and years for this to happen. But last night in the long awaited anxiously anticipated completion of the findings handed down it was Affirmative Action who overcame the odds and beat the Supreme Court, handily, in a unanimous decision, 2 wins to none. What a series final. "The game was amazing, one for the books – the drive, the sweat, the beer, the fans, the ladies – really, what more can you ask for? It was a night that truly defined the spirit and camaraderie of LegalMatch; an amazing game with amazing talent and heart, and I can only imagine the impending glory of the ping-pong tournament." "Wednesday night was an excellent display of competitive spirit on the part of both teams. Like in Yankee stadium we had a lively crowd, which made the event that much more exciting. Hats off to the Affirmative Action team. They played clutch ball when it counted. Also, kudos to Laurie Wells' homestyle Chili!" "Well the game was very exciting and hard fought by both teams. My loyalty was with Affirmative Action, so I was pleased with the outcome. The one thing I was not pleased with was the ball flying in through the door and knocking a full beer all over me. Food – Drink & Entertainment! Basketball to my right - baseball to my left. The only thing missing: Togas. No one but no one will ever doubt the heart, commitment and ferocity of the warriors that played the court that fateful night. The San Francisco sky literally opened to grace the showdown. Even while pulling double billing against one of the greatest baseball championships of all time, our own heroes raised our passion and connected us and gave us the gifts of sweat, adrenaline and joy. Hell – what I mean to say is – I had a GREAT time and loved being there with all of you. There was NO PLACE better to be. Yes, there was a sense within the crowd that this would go down as a day in LegalMatch history to remember. and the amount of blood washed off the walls this morning would attest to the intensity and desire spent to gain possession of that coveted Founders Cup. At the end, it would be Affirmative Action that would walk away with the vaunted inscribed crystal vase with the little milk chocalate balls stashed inside the Founders Cup. Oh My! Needless to say, the photos capture the action, but you really needed to be there to get a sense of the energy and mounting tension as every players' movement seemed to fire up the entire crowd upon the rooftop garden. 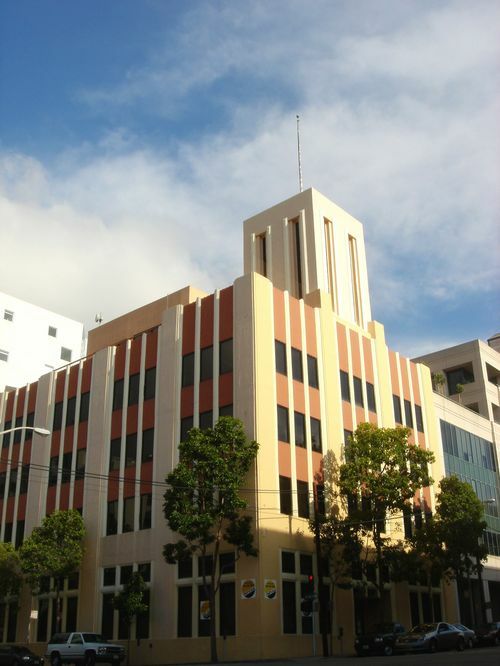 This must have surely aroused the South of Market neighborhood, where our HQ resides, as it might have seemed that Pac Bell Park had suddenly drifted several blocks north and onto the top of our LegalMatch building. We certainly may have made just as much noise in our cheering as would have been heard on a normal night of Giants baseball just a few blocks away. Every point in this contest was earned. And official Referee Randy Wells was not about to let any hanky panky go unnoticed or un-penalized. Wells kept a watchful eye over the play of all 10 contestants and in the end it was team work and desire that would make the difference. After the game, reporters visited both the winners and losers locker room. So, Pete JaReis. What were you thinking while out there in the heat of the battle? "I was thinking Inter-departmental events (in any form) are a blessing." OK, er... How did you manage to get so open on that hook shot? I see. uh...Do you feel like you may have played your best game of the season in this one? Ok, Ok. Uh Thanks Pete...now let's go over to the losers where Diane Tran is standing by. Diane? I'm standing here with a dejected Ice Man. Ice Man, what happened out there tonight? The Red Sox won. They just kept coming back. We thought we had them but they just wouldn't quit. Well, what about tonight's basketball game? Did the Warriors play tonight? No you dumb bunny. The game you played in against Affirmative Action? where a bus ran over me. Geez. I think that about wraps it up from here Lance. Back to you. Ouch! Sounds like the Ice Man went through a meltdown. Well, it looks like the fans got the game they were looking for. Plenty of competitive spirit. Lots of talent on display, including the comedian who hosted the event, Arthur Gaus. He was funny. So great entertainment was had by all. Remember, next season's Basketball draft is right around the corner for the 2005 Spring Rooftop Tournament beginning in March. Until then, however, the 2005 LegalMatch Winter Penthouse Tower Table Tennis Tournament trials will begin November 1st. Look for the announcements to follow right here on this same channel. So until then, Peace out. This has been brought to you by LegalMatch - If LegalMatch is the best place to find the right attorney, then, LegalMatch is certainly the right place to focus and grow a legal practice. Not to mention, an outstanding place to work, play, grow and continue to develop one's upside potential. Welcome to the adventure. LegalMatch Founders Cup Championship Basketball Game. The LegalMatch Founders Cup Trophy Championship game is set. Affirmative Action vs. The Supreme Court takes place TODAY at 5pm. Activities begin at 4:30 pm. The consolation contest between Rejection Sustained and Kill Ball Vol. 1 has been cancelled. Make no mistake about it...The Founders Cup is very much coveted. This crystal glass vase has a history deeply rooted in LegalMatch storied folk lore. Straight from co-founder Anna Ostrovsky's desk, the winner of tonight's game must take great pride in the privilege of providing care and attention to this silver and glass engraved prize which comes with a minimum of tradition, but loaded with an unexpected special treat for the victors. The 'Cup' should be cherished. Tonights Championship game will go down in LegalMatch history as the first of its kind during our 5 years of LegalMatch life to pit some of our company's best athletic talent in spirited competitive sportsmanship. Bringing together inter-departmental comraderie and team inspired cooperation for the good of the company's development as an organized and connected family. The Founders Cup game shall forever mark the eve of a new chapter in LegalMatch life. For as we now recognize in legend, in fable, as well as in reality, our founder’s little idea has grown to become the linchpin of the legal matching industry, and the foremost matching service for all citizens of the United States of America. Through these short 5 years, it has been our hard work and competitive spirit, our commitment to build the very best service available, our sheer will to survive, and at the core and fore front, our focused need to foster good connections and relationship for people who are in harms way that has driven us to hold and secure this enviable position. So, let us find honor and joy in our achievement, and yet, let us not forget, that if LegalMatch is the best place to find the right attorney in America, then surely, LegalMatch is truly the best way to focus and grow an attorney's practice. That is what LegalMatch meant 5 years ago and that is what LegalMatch still means today. Let this continuing mission serve and stand for us all to remember as the true meaning and spirit of The LegalMatch Founders Cup. Here is your line up for tonight's Championship contest. A force in the paint, Peter Reis rebounds like he’s fresh out of a six year relationship. His left-handed semi-hook shot continues to punish, despite repeated efforts (and fouls) to contain it. Also answering to California Fats, Reis’ outside shot leaves something to be desired, but tenacious defense and great vision of the court complete an otherwise all-around game. 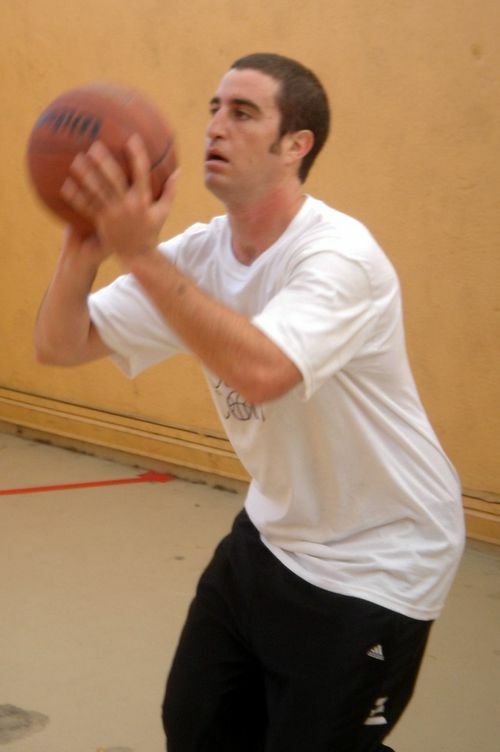 Has the vision and foresight to quickly confuse his opponents while driving unscathed to the hoop. The only vision his opponents will be seeing is “so help you god,” which is the slogan tattooed on the back of his jersey. If this up and coming star is on point, there is no telling what can stop Supreme Court. Coming from a soccer, pole vaulting, snowboarding and muay thai background, Alex offers a diverse package of vision, agility, and overall confidence on the court. His quick dribbling skills open the court for pull up jumpers while his Jason Kidd-like defense provides a consistent flow of steals. Keep an eye out for the no-look passes. Has a variety of ways to beat you. Can drive, shoot from the outside, and post up. What stands out is his ability to defend. Perhaps the leagues leading shot blocker, is also a magnet for loose balls. Pretty much a complete player as he passes just as well as he shoots. If there is a weakness, he tends to take risk and can be caught overplaying. Average rebounder. They call him the “2 Minute Assassin” for a reason. This guy has a knack for being in the right place at the moment the decision needs to be made. He can cut right through to the heart of the issue and come away having made a powerful impact. He leaves no doubt about the outcome. You have to be aware of where he is on the floor at all times. Even if it is just on the sidelines there is reason for concern. He can be a factor to be concerned with. Don’t let the untied shoe laces fool you. 5'7" 120 lbs of Badass. Ziffrin’s strategic force can not be denied. With arguably the strongest draft, she has leveraged her talented team to the Championships. While on the court, she is consistently looking to create openings for her top scorers. With no prior basketball experience, she plays like a seasoned veteran of weeks. Known as the "Bombay Baller" to most, Ushma brings a natural athletic ability to Affirmative Action with her unprecedented reach under the hoop for snagging the boards. Her patented "skip-step" can be deceiving to officials because of her swift leg movements, usually resulting in a quick give n' go for an easy bucket from the paint. She has been instrumental in the first game of every match to give Affirmative Action the quick lead they usually establish. With a wonderful wife and new baby girl everything matters to Jeff. That includes how he performs on the court. Nothing gets wasted. A powerful upper body serves him well as he takes his opponents straight to the hoop for efficiency and economy of movement. The results are usually positive. Deceptively quick. Who knew? As quiet as a mouse chooses not to step into the limelight. Just an extraordinary role player. Kurt usually lies in wait to watch and wait. Watching and waiting, then, suddenly strikes quickly. Normally his shot rings nothing but net as he's a pure shooter. Just about the time you think he's off his game then bang bang bang, he's shot you down. This player knows no fear. Plays with a mission. Not the player you want to guard if you aren't in shape. He's here, he's there. Deadly outside shooter, but should he miss, he's there to follow up and put back his own shot. Plays with a sneer on his lips that can lull you into a false sense of security. That's when you realize this is a lion on the prowl for his next meal. Don't be caught napping. Alex Karzag - "Even though our last two games-to-none match barely left me sweating, I'm still anticipating a good game." Lance Burton – This is the game that I was not looking forward to. These players on Affirmative are tenacious in every aspect of the game. They just won’t quit. I think we can beat them if we shoot with a high percentage and keep them from getting second follow up shots. We’re certainly capable of doing that. I think you’ll see a different Supreme Court than the team that lost to Affirmative in the league championship game. Teejay Clemena- "Affirmative Action will take the title, NO DOUBT. We are like a speeding Train with no brakes and all I have to say is MOVE OUT! Supreme better bring a box of Lucky Charms because Affirmative Action is bringing Lots of Game. May the best team win." Augie Chun - Well I think the bench shooting is going to be critical for each team. If Sacramento/Teejay or Jian/Kurt come out firing then the emphasis will be taken off the low post. Kurt Jerdon had the hot hand against Kill Ball so he is definitely a threat from the outside. If Affirmative Action puts too many eggs in one basket by concentrating on Gutman then Supreme court can really attack AA and break down their defense. However, the team work between Reis/Karzag is at an ultimate high. They definitely came together in the third game against my team The Rejection Sustained last week. They definitely have a silent understanding of when to cut and when to throw a pick. A definite factor to consider. Ona Ahumada - I think for Affirmative Action the game rests squarely on Jeff Sacramento’s shoulders. Jeff’s outstanding play has given Affirmative Action the privilege of sitting out world class TeeJay Clemena (Fillipino One/Bite Size Samoan/the Assassin), and bringing him in once they need the clutch shot from the outside. If Supreme Court can wear Sacramento down early and have a fresh Ouyiang/Jerdon guarding the “2 minute assassin” the game will probably be closer. I would suggest a man to man defense. If I were Coach Ziffrin I would also ask Randy Wells to draw up some plays. As Karzag and Reis have made clear it pays to have game and some strategy going in. I think the key for Supreme Court coming out on top is to learn from the example of Rejection Sustained- the only team thus far to beat Affirmative Action and play tough defense and aggressive offense. Doug Ott - These are two evenly matched teams. Both deserving to be in the grand finale. If Burton can find his sweet spot on the court and Gutmann can catch fire, Supreme Court will be tough to beat. The Court has depth to boot. Jerdon was on fire last game and Ouyang can hit you when you least expect it. Yet the most recent outing of the Reis/Karzag combo was impressive. If Supreme shuts that part of the game out, they'll then have to deal with Clemena or Sacramento getting hot from the perimeter. Tough call on this one. On ESPN's Sportcenter last night, Chris Berman said that this game will come down to the two women - Multani and Ziffrin. He said that the two are both physical and will hold their ground. Ziffrin proved to be effective under the basket, while Multani will sacrifice her body for a solid pick. Whoever gets the hot hand could make the difference in the outcome of the game. I agree with Berman. Either way, the match will go the distance. I would recommend getting to the Rooftop arena early if you want a good seat. David Merritt- This match up will certainly be one for LegalMatch’s posterity. Affirmative Action has the youth and brawn to come out ahead; however, Supreme Court has the ability to undermine such advantages by handling AA as a matador does the Bull. i.e. directing AA’s aggressiveness to work for them. Ona Ahumada - The Red Sox proved last night that championship teams win through perseverance and heart. My money is on the team that brings the most heart to the game on Wednesday. Rose Platt - I'm really looking forward to Wednesday's game; it takes a lot to make me stay late at the office, but I'm not about to pass up my last chance of the season to watch my coworkers beat each other up in a concrete box! My loyalties are divided, since my fabulous current boss (Pete) is playing against my fabulous former boss (Laurie), so I'm glad my RSI is better and I can applaud for both teams. Maybe this week someone will finally get around to making microwave popcorn for all the spectators, since nothing but beer gets kind of boring after a while. I'm also hoping for a chance to meet more of my coworkers' spouses and significant others, since we've been seeing an increasing number of them showing up to playoff games. I've been thinking about running a team next season, but that would mean missing out on a lot of the fun that comes with being a dedicated spectator. You can bet I'll be keeping an eye on this game, though, in case I do end up needing to make some draft picks! Sam Adler - The championship matchup between Affirmative Action and The Supreme Court has been rumored to be similar odds to the USA vs. USSR hockey match of the 1980 olympics. The odds are stacked against Supreme Court 3 to 1, but those close to the Justices have said that they fight stronger as the underdog. Heard in the locker room, AA was telling SC that their egos were cashing checks their bodies couldn't cash. In response, a spokesman for SC said, "yea yea. Big egos are big shields for lots of empty space." This should be a great matchup. Take the odds. Jonathan Lott – I should say old chap, basketball is not a sport we Brits take to quite as charmingly as we would say a grand old game of cricket. Be that as it may, in the spirit of Queen, and her Majesty’s Royal Ascot racing affair, I must place my quarters with the party that has history on it side. The Supreme Court is favored by 4 points to win this entire matter. Place your Eurodollars on my desk, please. Yes, to be sure, this is Wolfgang here. Tuesday night. A 70 percent chance of showers should make for a slick day. With lows in the lower 40s to mid 50s should be a chilling afternoon and evening, since southwest winds will bring 10 to 20 mph gusts to around 30 mph. Becoming west 5 to 10 mph after midnight. Wednesday. Look for partly cloudy skies with a 40 percent chance of showers mostly during the early part of the day. Highs from the mid 50s to upper 60s. Game Time, I suspect that all will clear up by the games start at 4pm. Rumor has it that should it rain, it will be perfect for making a fine, hearty brewski? Ushma Multani – Questionable. Doesn’t like people looking over her shoulder at desk. Officiating…The officials and score keepers have been announced. Randy Wells will step out of the Executive Suite to blow the Officials’ whistle on this game. Rob Devereaux and Myk Brown will be the Official Scoring Statisticians . And Arthur Gaus will be your MC for the whole event. Let’s get ready to Rumbbbblllleeeeee! Affirmative Action Advances to Championship! I thought Affirmative Action was rejected by the courts in the 1980s. Somehow, Affirmative Action continues to hold on as it met the challenge of the favored Rejection Sustained last evening in a wildly exciting 2 games to 1 playoff victory. The win launched Affirmative Action into the LegalMatch Basketball Championship match up next Wednesday for the Founders Cup Trophy against The Supreme Court for a once and for all the marbles show down. The game last evening featured all that the players and the spectators could have asked for. The leagues’ top scorer versus the leagues’ top rebounder. Two tough defensive teams who both have relentless offensive weapons and fire power to burn. Both teams carry strong bench reserves. No one disappointed. This match up would be just about as good as it gets without having the Trophy on the line. In the first two games no one could be sure of the outcome because the two teams seemed so evenly matched. Of course, the results became a split of the two games. 10-8 Affirmative and 10-5 Rejection. The 3rd and final game could have gone either team's way. Affirmative Actions’ Alex Karzag and Peter Reis continued to show they are consistently clutch performers when a big shot or rebound was needed. Jeff Sacramento, who earned a spot in the starting rotation after his performance in Tuesday’s game, was a menace to the Sustained defense. 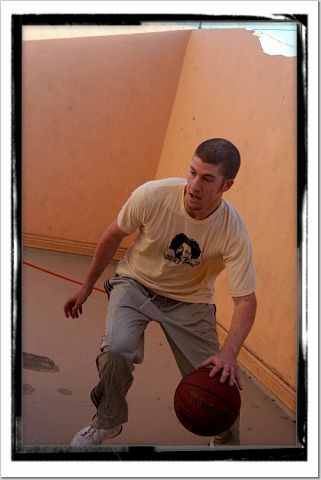 He continually found himself alone under the basket for easy hoops. But the play of this trio was balanced by their Rejection opponents in the name of Ken LaMance, Randy Wells and Matt Griffith. So, it would be left to the unknown factor. Would it be Augie Chun or Teejay Clemena? For a minute, it looked like Augie Chun would run away and steal the game for Rejection Sustained, as he put on a show for the ages. With 9 points and 2 – 2 pointers, it appeared he would single handedly carry Sustained on his back to the Championship. But it wasn’t to be. Once again, with the game on the line, the “2 minute Assassin” showed up in the form of Teejay Clemena to shift the momentum away from Sustained and back over to Affirmative Action. This was a pivotal moment in the series. Caught along the back wall, for a second it looked as though Teejay had traveled, but there was no call from either official Ed Lin or Kurt Jerdon. In the space of a hair, Teejay spun around and launched a big 20 foot jump shot, reminiscent of a street ball play that seems to define his game, and hit it! Nothing but net, Swish! That single play seemed to let the air out of the entire Sustained team and all the fans that were rooting for them. There definitely appeared to be a stronger fan base rooting for the Sustained team as they were the favorites and represented a chance for a glamor game that would have pitted two of the leagues best performers in Supreme Court's Michael Gutman against Sustained's Matt Griffith. But that was not to be. This play by the Assasin was like a dagger through the heart of those fans waiting for that match up. From that point in the game Sustained was subdued. An open jumper from Karzag and a patented jump hook follow up and put back by Peter Reis ended the game to the delight of Coach Ushma Multani. Multani, who sat out the entire contest, was giddy with excitement. She could be heard telling all around who asked the question…now that you’ve made it to the Championship finals…what are you going to do now? Multani’s response…”I’m going to the October Fest and drink beer!” And that she did. Congratulations Multani and good luck to your team against the highly respected Supreme Court in the LegalMatch Rooftop Championships. We are gathered here today...in support of one of our fallen basketball teams. An angry Supreme Court, seething from a loss the previous night to Afirmative Action, that dropped them from winning 1st place in the LegalMatch Rooftop Tournament, tortured the Kill Ball team under the burning hot sun of the Rooftop Garden last evening. Actually, Kill Ball is still alive and kicking, but just barely. Rather than being a contestant in the Championship series next Wednesday the 20th, Diane Tran, Richard Fianza, David Merritt, Jason Hudgins and Frank Perkins of Kill Ball will have to resurrect themselves in the Consolation game only to try and capture at least the 3rd place ribbons of the Playoffs. Missing 2 players from their roster, Kill Ball did well just to make it through 3 tough games under the 90 degree heat and against the full weight of the Supreme Court's ugly ire. Led by Kurt Jerdon's 6 point first game, followed up by Michael Gutman's game high 10 points and the overall balanced scoring, and defensive efforts put forth from Lance Burton, Laurie Ziffrin and Jian Ouyang the Court ground the short handed Kill Ball team down into a shallow grave. The win places Supreme Court right back in the favored position to win next weeks championship game. Of course, Affirmative Action and Rejection Sustained, who play in today's Playoff contest may have something to say about who is the favored team. the match up today should be a good one as Karzag, Reis, Sacramento and Clemena try and stop the league's scoring champion Matt Griffith and his band of support players including Randy Wells, Augie Chun, Ken LaMance and Captain Lesley Murray. The winner will face the Supreme Court in the big LegalMatch Championship game on the 20th for the LegalMatch Founders Cup. By unanimous decision - Ushma Multani's Affirmative Action knocks Laurie Ziffrin's Supreme Court out of first place and wins the Fall 2004 LegalMatch Rooftop Garden Basketball Tournament. In the final match up of the season, before today’s start of the Garden Playoff series, Affirmative Action disrupted the Courts’ ride to an undefeated record by beating the court 10 – 3 and 10 – 7. Kurt Jerdon summed it up this way “they made their shots and we missed ours. That simple” The loss humbled the Court as the game plan they laid out was foiled by the usual solid games from AA’s Alex Karzag’s game leading 8 points and Peter Reis’ 7 points and 17 rebounds. Contributions from Teejay Clemena helped to win the second game, and a big 2 point shot from Jeff Sacramento that fell like a 'smart bomb missile' capsized Supreme Court to win the first game. Augie Chun, who’ll likely draw the assignment of guarding Jeff Sacramento in Thursday’s playoff series between Rejection Sustained and Affirmative Action, commented that Jeff Sacramento “continues to surprise. Jeff is a lot bigger than he appears and his shot is deceptive.” Deceptive is an understatement. No one on the floor or anyone watching the game expected Sacramento to come in late to the game and throw up what looked like a prayer shot only to hit nothing but the bottom of the net and deflate Supreme Courts’ hopes in the first game. In the second game, it was Teejay Clemena stepping up big. 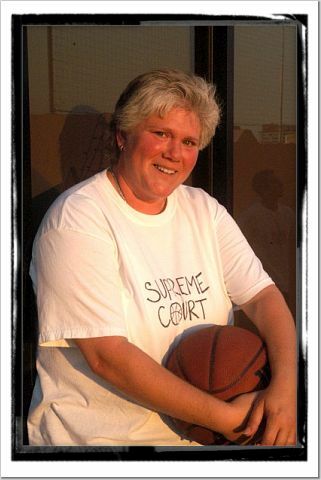 Clemena, who played like an assasin, commented after the game “we sent Supreme Court to a 25 to Life sentence” To spectators viewing from the sidelines it probably appeared as though he did just that. With the Court leading the second game by 3, Clemena entered the contest and turned on his speed and guile to drive to the hoop for a score on one play and drilled a scintillating set shot from 15 feet for another score that seemed to turn the games momentum in the favor of Affirmative Action. The Court had not expected Clemena to be much of a factor in the game. Welcome to reality. Congratulations to Affirmative Action on a great season. You did what it took to come out on top. We applaude you. If there is any consolation for the Court it’d have to be that should Burton, Jerdon and Ouyang make the outside shots, which they normally hit but missed in this game, the Court stands a good chance to come back and win should they face Affirmative Action again in the Playoff. Of course, they will all have to serve that 25 to life sentence first. Speaking of the Playoffs, the whole thing gets started with Kill Bill Vol. 1 against Supreme Court today at 5pm. Thursday’s game pits a well rested Rejection Sustained against Affirmative Action. Both contests will determine who plays in the Championship contest next Wednesday the 20th. This reporter will be there for all the action. This is going to be exciting. To the supporters of LegalMatch Rooftop Garden Basketball the players thank you for your enthusiasm, your interest and your excited behavior. Without your participation this would have not turned into the "fun at work - this is kind of a blast" experience its become. Thank you all. Now, its on to the LegalMatch Rooftop Playoffs. Pictures of last night's game can be seen listed under Affirmative vs Supreme. Courtesy of Diane Tran. Get ready- LegalMatch Winter Penthouse Ping Pong Tournament is just around the corner. If you didn’t know any better you’d think the two men in the photo below were watching the launch of the new LegalMatch website begin its ascent toward the heavens for the next level of our success. In reality, the photo signifies two players from the LegalMatch Rooftop basketball league, whose ball teams are drifting in completely opposite directions, but whose dedication to LegalMatch has teamed them up in a strategic battle for greatness. Rejection Sustained, as represented by Randy Wells on the left is playing to secure a place in playoff game history while Revenge of the Nerds’ Neil Fradkin is battling just to preserve some sense of dignity from a basketball season that never quite developed the winning momentum expected when Fradkin was chosen first in the draft last August. Nevertheless, Fradkin has shown marvelous progress in his play over the course of the season. What’s more is he’s displayed super human strength, determination and courage by engineering the new LegalMatch website to be technically sound, fundamentally correct, thoroughly tested and ‘launch’ ready in record breaking time. 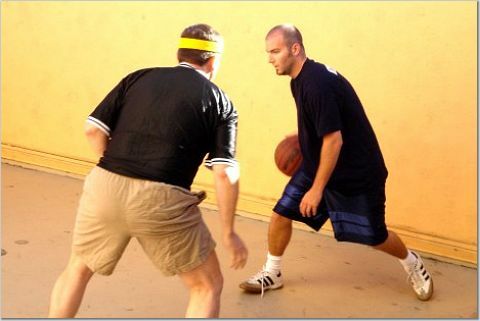 Those moves couldn’t help Neil on the b-ball court but the contribution the new site will make to the success of LegalMatch is unprecedented. Unfortunately for the Nerd’s basketball team this day, veteran b-ball players like Randy Wells kept stepping up in the game to shoot the lights out. 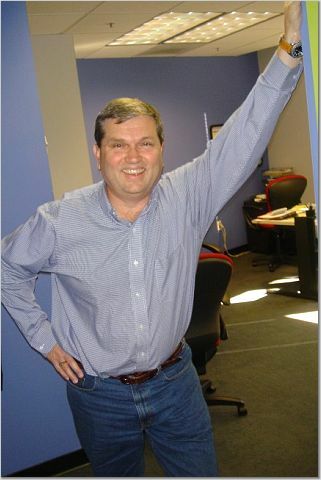 Randy Wells played like a man made of steel, while at the same time, keeping his eye on the prize of pushing organized initiatives to the table that brought all the elements together to ramp up, build out and focus the company’s efforts in getting this new LegalMatch website out to its anxiously awaiting public. At that point the basketball playoffs proved just a bit too daunting for the bits, bytes and binary guys as the on court victories came up just a hand full of shots short, and thus, out of reach for the Nerd team. The Nerds finished 0&5 for the Tournament, but did an absolutely brilliant job of managing the build out, quality assurance, migration effort and production servicing for our stunningly attractive and useful new website. While at the same time they kept all the other LegalMatch systems flying high and functional, too. Go Nerds! As the old Yogi Berra axiom goes. “There will always be a next year, and it will be like dejavu all over again.” That’s what I’m talkin’ bout. This final contest between the two teams was played with a certain degree of friendliness as the players seemed rather familiar with each other. In fact, there were two players with the same last name of Wells playing against one another. The two captains actually work side by side in Member Services. And, rumor has it that two of the players from the teams could be dating. It’s not clear who they are dating, but the word is out that there is some dating going on. No one would speak to this reporter after the game to confirm whether there are dates that are booked or dates that are reserved or whether there is even a calendar of dates to consider. However, some spectator on the sidelines did mention that the dates were yet to be determined. I think this is good. That way you have a date when there is no date. The investigation is still in its early stages. Stay tuned. 2004 Rooftop Tourny: Affirmative Action Advances to Championship! 2004 Rooftop Tourny: Kill Ball Killed!